Black and White Honor Cords for Graduation and Royal Blue and Silver Graduation Cords for Academic Honors and Commencement. Braided Graduation Cords are a great way to represent multiple colors in one cord. All of our honors cords have two or three braided together to form one cord. We have two and three color combination of braided honor cords. You may choose any two or three color for braided honor cords. Our Braided cords come in many color combination. Please specify your color combination. We also make Rainbow Honor Cords. 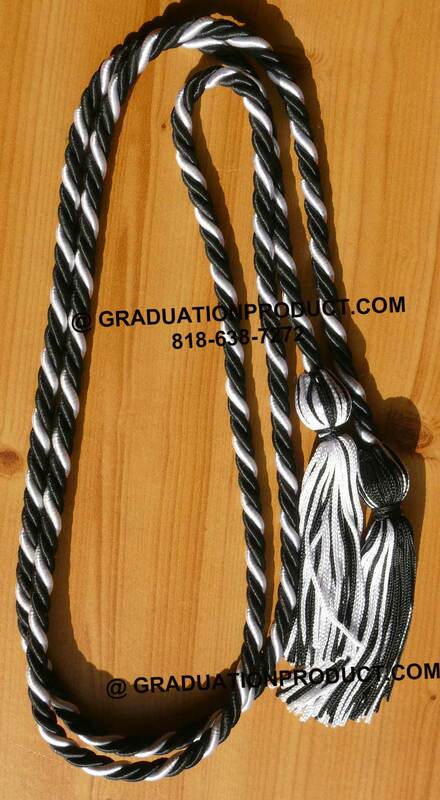 Customer Reviews on "Black and White Braided Graduation Cords"
Easy to Order Honor Cords @ Graduationproduct.com with fast service! Carry high quality Honor Cords. Write you own review on "Black and White Braided Graduation Cords"